The war between Spain and France raged on. After the last french defeat (viewtopic.php?f=108&t=47104) the french High Command decided to send another army against the Spanish Netherlands to take Brussels and destroy their hated enemies. 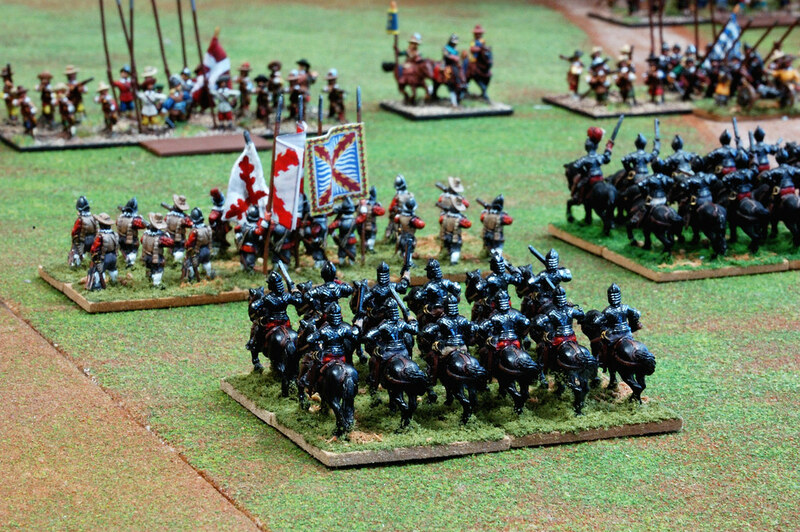 The spanish spy net had warned against the high number of mounted troops the french had recruited for this campaign, so they had to deploy cautiously. What were the french ploting? Finally the two armies encamped a few kilometers away one from the other, thus tacitly accepting to give battle the next day. 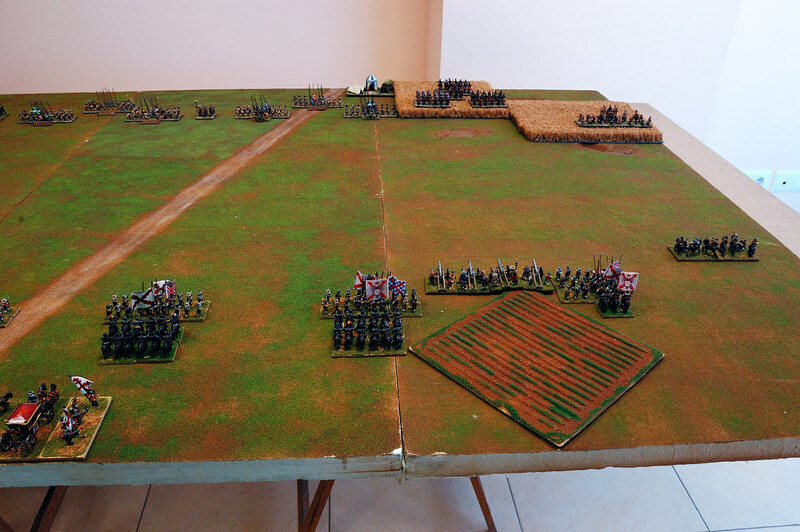 The chosen battlefield was a plain with some open and closed fields on the margins, and a plantation on the spanish far left. The sky was sunny but the morning was cold. The troops deployed in order while the officers shouted their speeches and the priests raised their prayers. 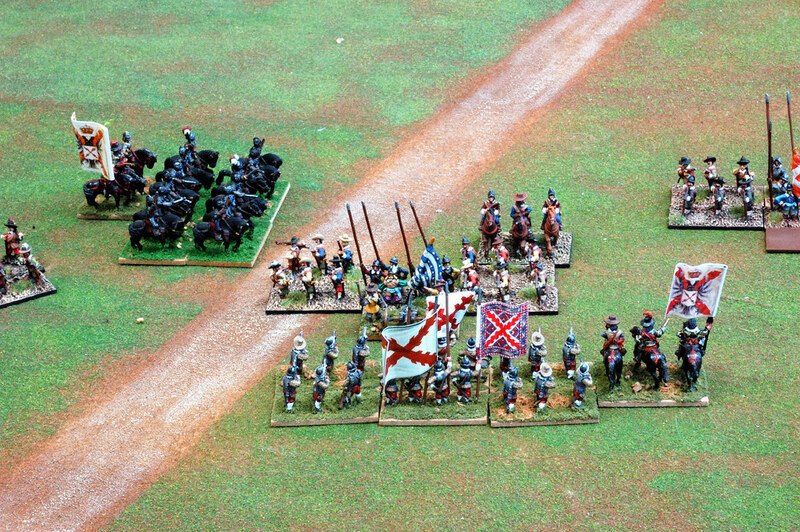 The french army chose a classic deployment, with infantry on the center and cavalry on the wings, with most of the mounted piled on their left wing. Their right wing was supported by the artillery park. 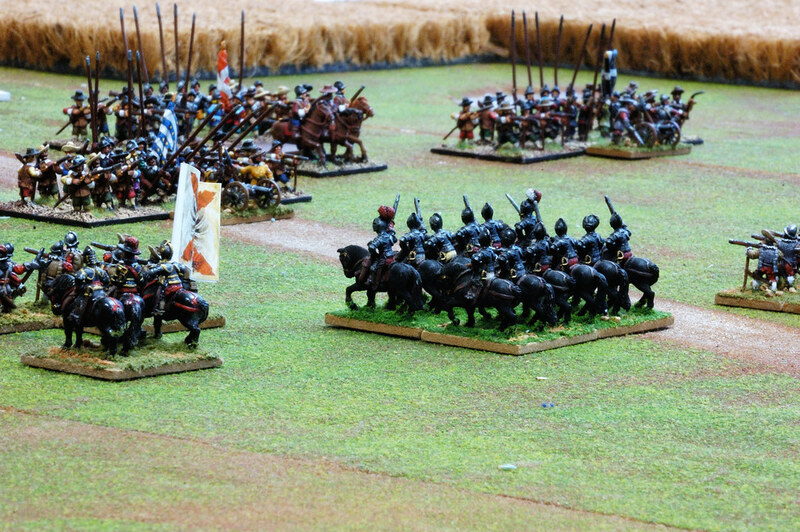 The spanish army, however, deployed its mounted behind their infantry, with the dragoons covering the wings. Its artillery rested in the right wing. 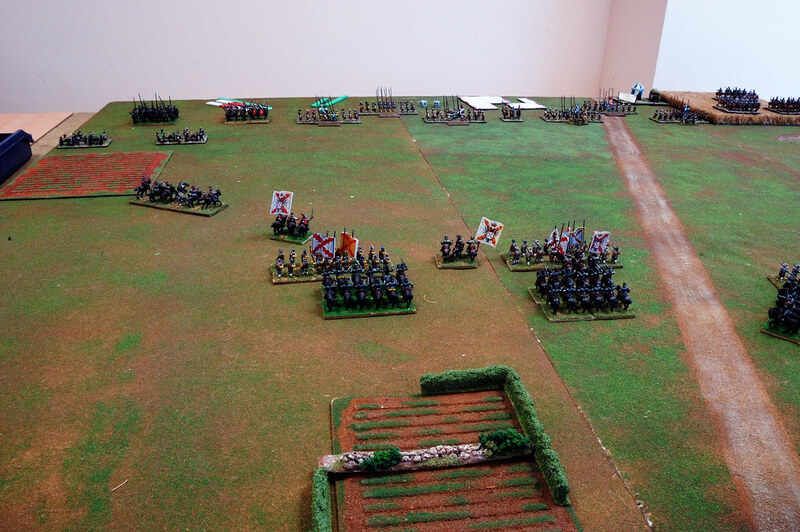 The battle started with a determined advance of the spanish wings. The centrer advences cautiously. 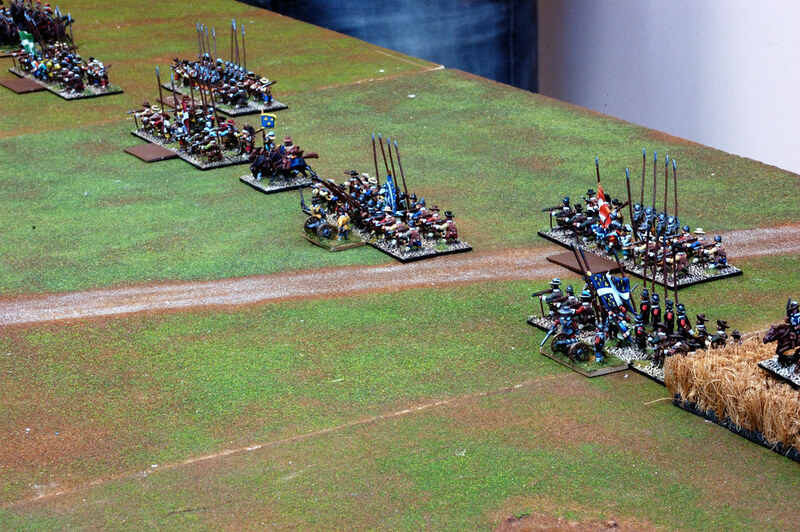 The french advance all the army. 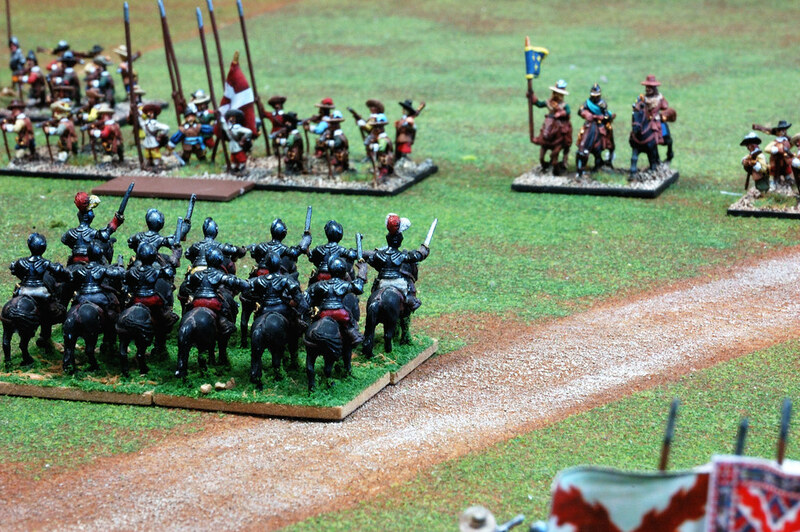 Their dragoons in their right wing, more numerous that the spanish ones and supported by their main mounted troops, make their enemies withdraw and look for the protection of a nearby tercio. 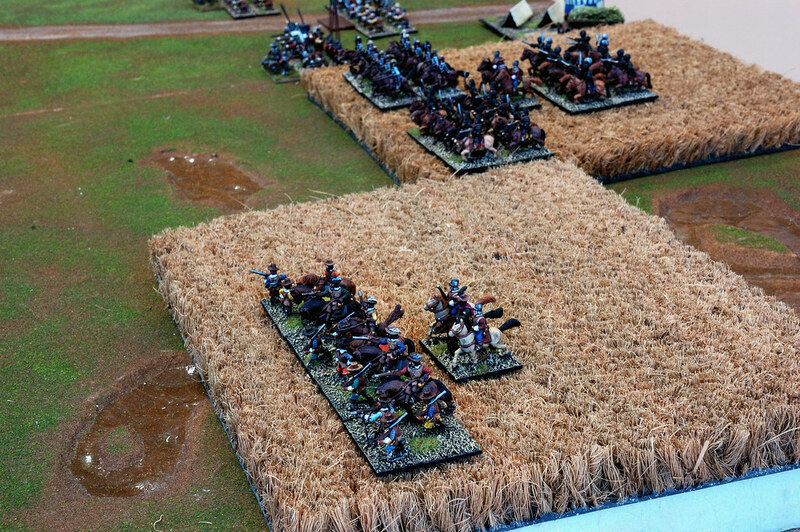 On the center a group of spanish cuirassiers receive advance orders and go through the gaps kept between the infantry. 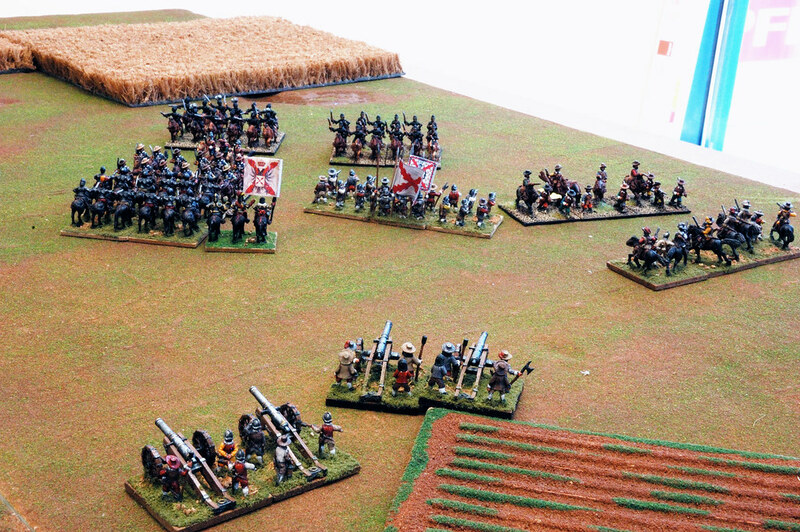 The rest of the cuirassiers keep waiting behind the slowly advancing infantry. 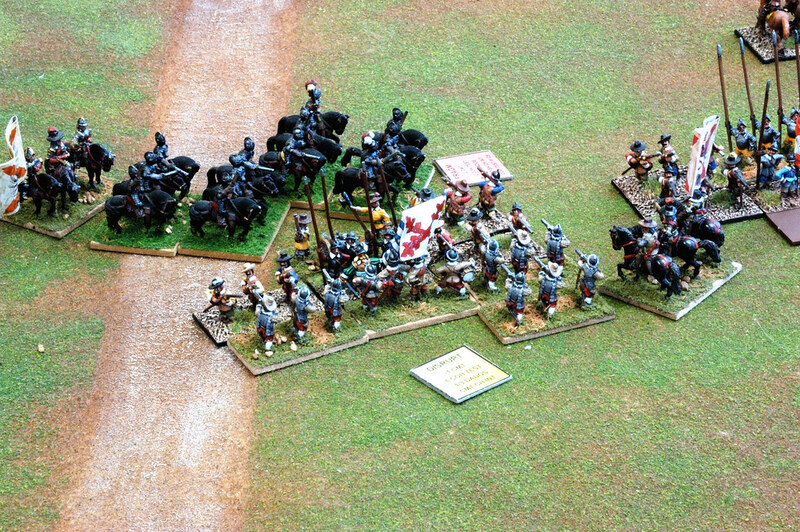 The spanish dragoons of the left wing threaten the enemy artillery, but have suffered casualties. 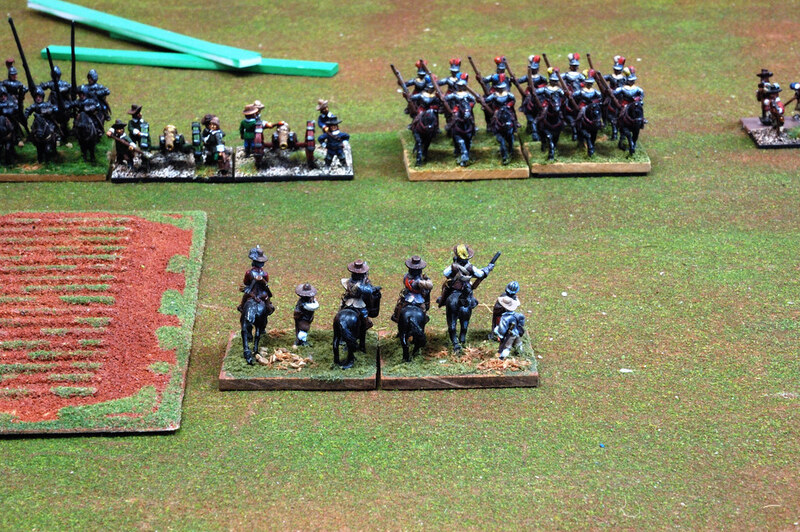 The french cavalry there stay still, to protect their artillery or unable to move much because of the plantation at their front. 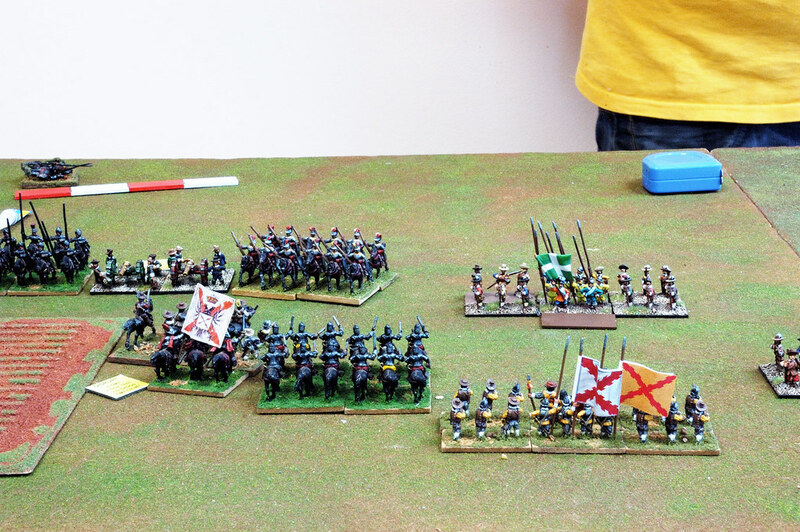 Finally the rest of the spanish cuirassiers advance and form a battle line with the tercios. 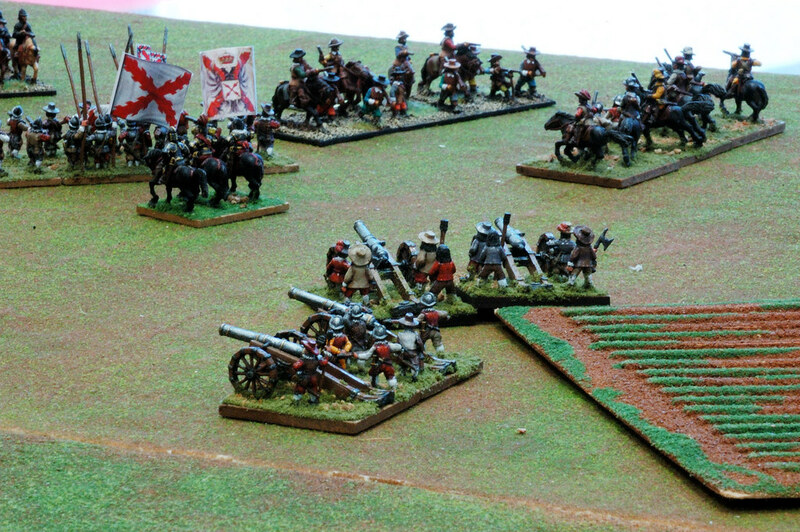 The french dragoons suffer badly from enemy artillery and muskets. 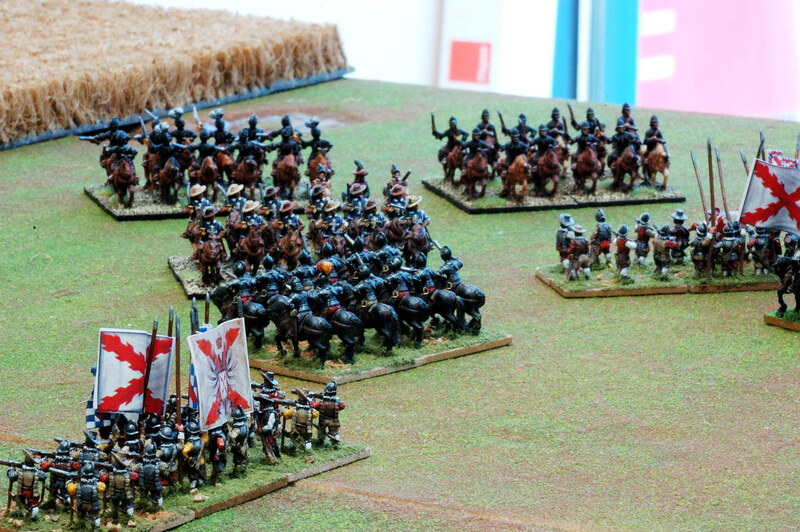 The King´s Musketeers advance gallantly to face the more heavily armoured enemy cuirassiers! Vive La France! 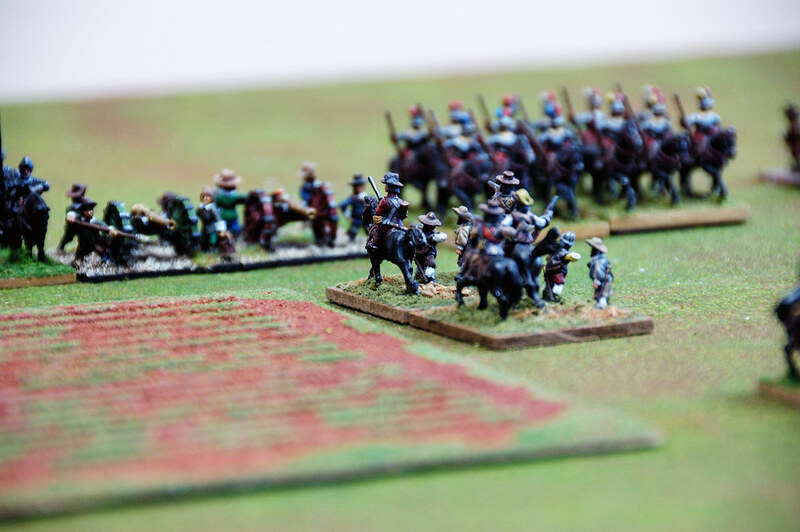 French and spanish infantry get into musket range and the french seem to be aiming better... A veteran tercio that was suffering heavy casualties charge desperately into a french regiment and is annihilated in melee! 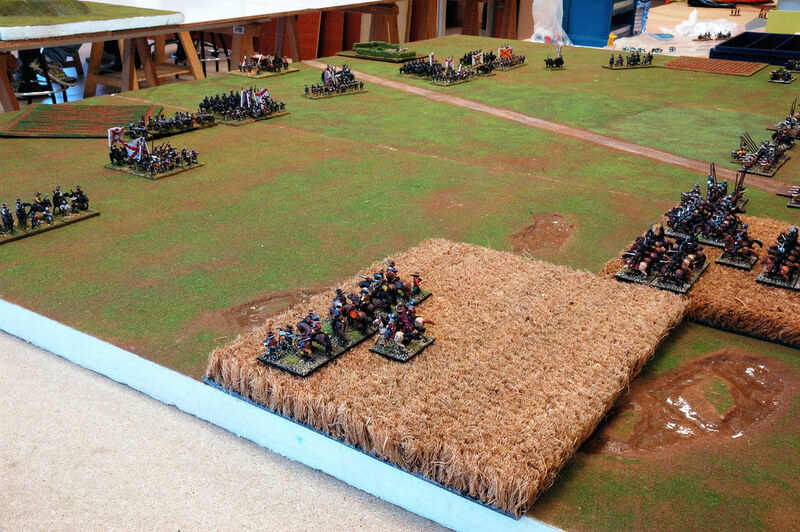 The nearby cavalry gets disrupted, worried about the catastrophe. 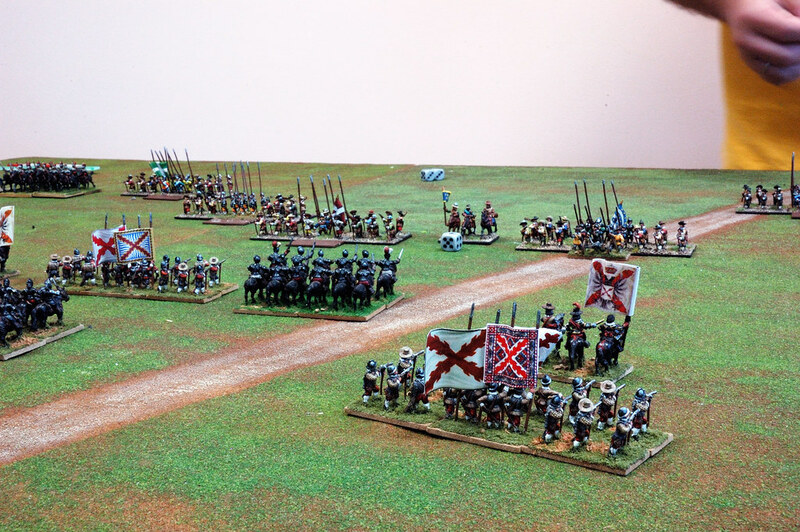 On the right flank the spanish have formed a solid defense and stop the impetus of the french mounted assault. 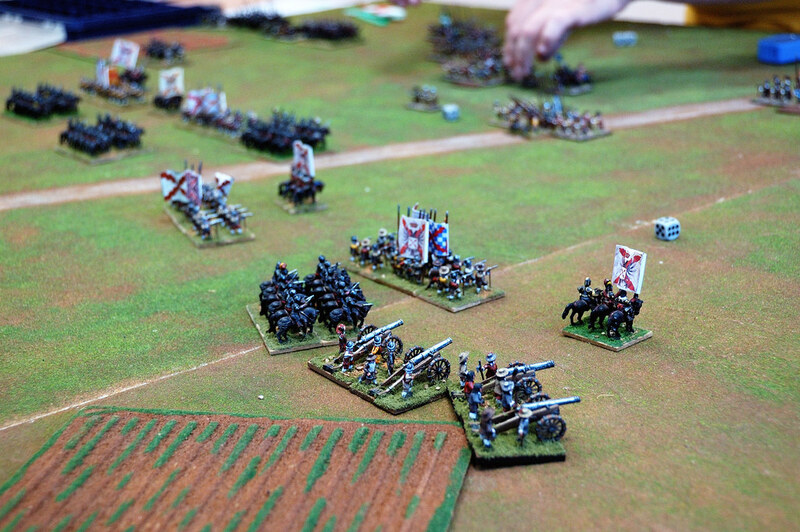 The french dragoons on the right wing are annihilated by an intense fire. 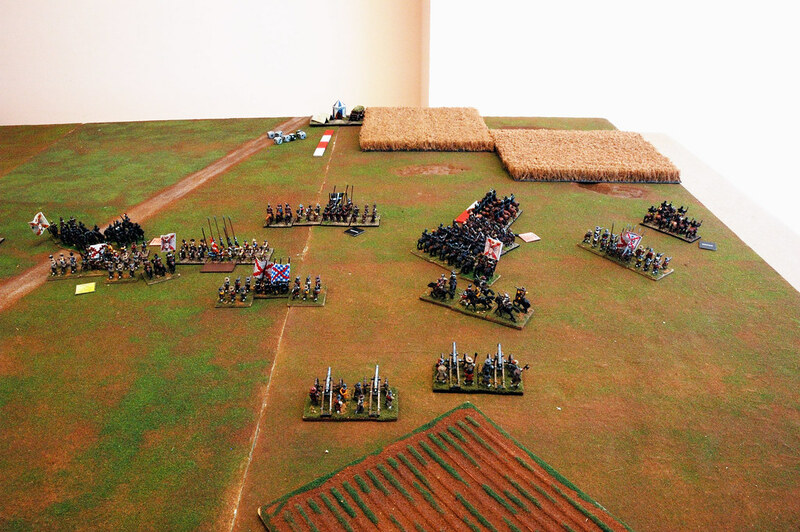 The french mounted charge desperately against the tercio, with dire consecuences. 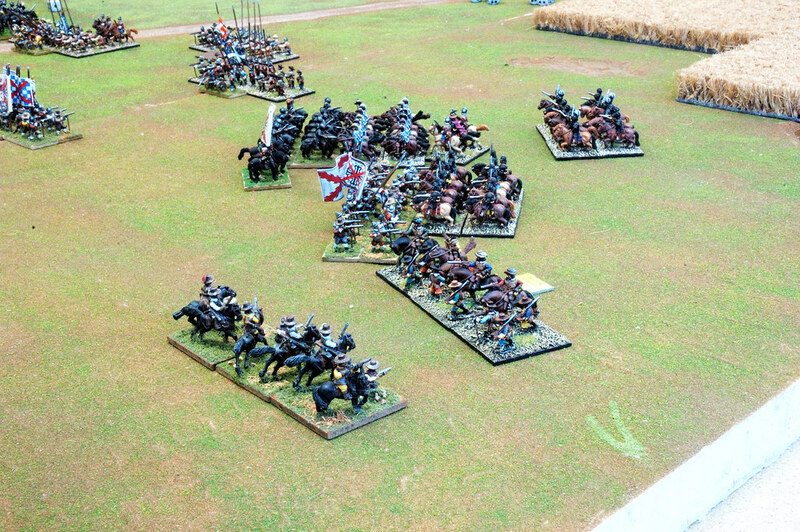 The King´s Musketeers, despite losing their general and fighting against properly armoured cuirassiers, hold like titans and refuse to lose cohesion or suffer casualties. Vive Le Roi! 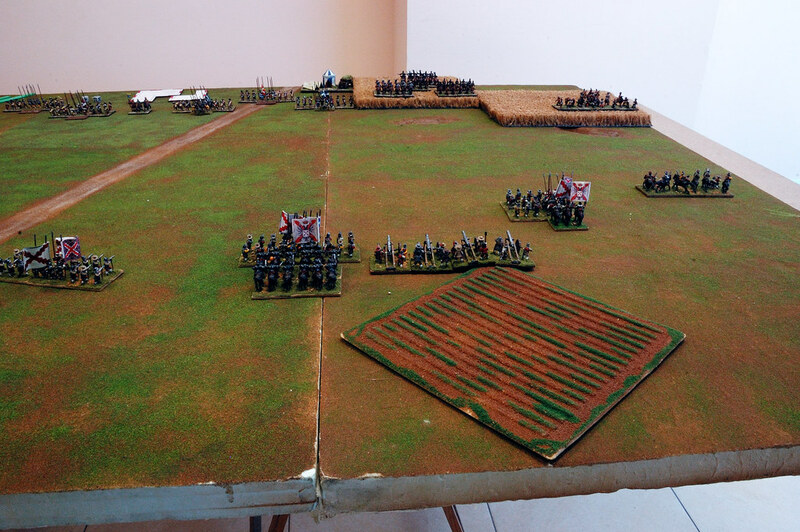 On the center the situation doesn´t look good for the Army of Flanders. 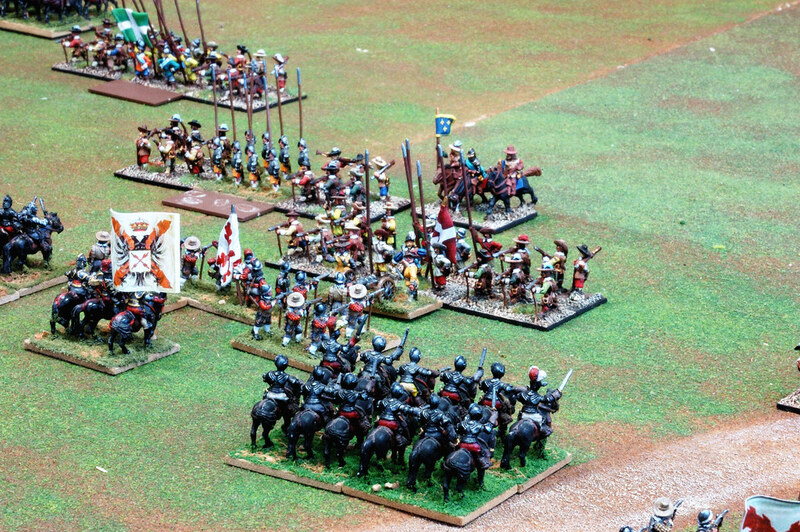 Besides the broken tercio a group of cuirasiers get fragmented. 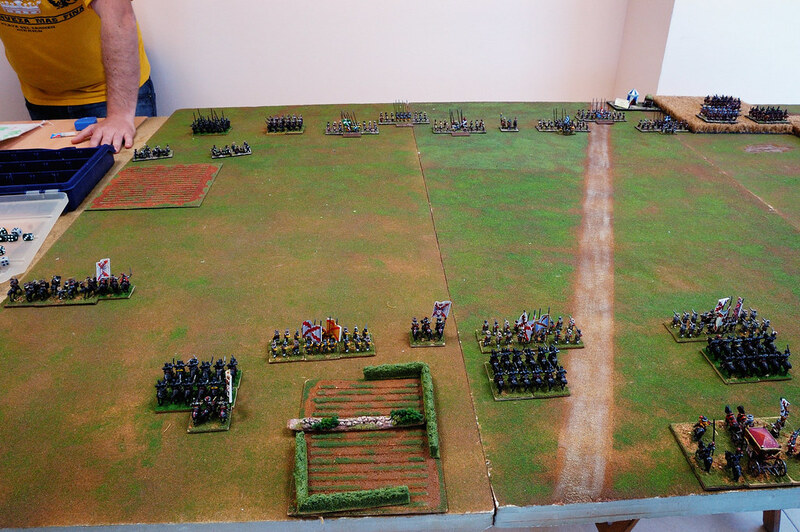 But the french have made a serious mistake as their regiments have left a hole among them, and a group of spanish cuirassiers are able to sneak through it and turn to threaten the flank of a french regiment. 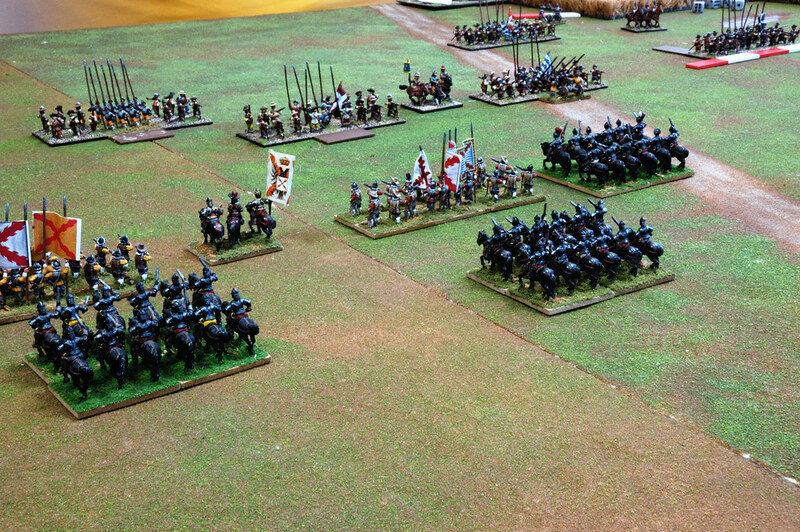 On the left wing the cuirassiers clash and the spanish get the upper hand. 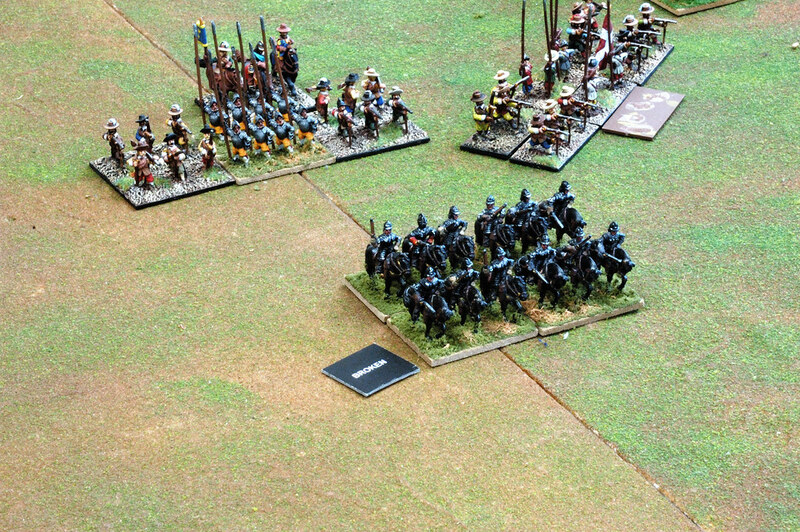 The fragmented spanish cuirassiers take enemy fire and break. 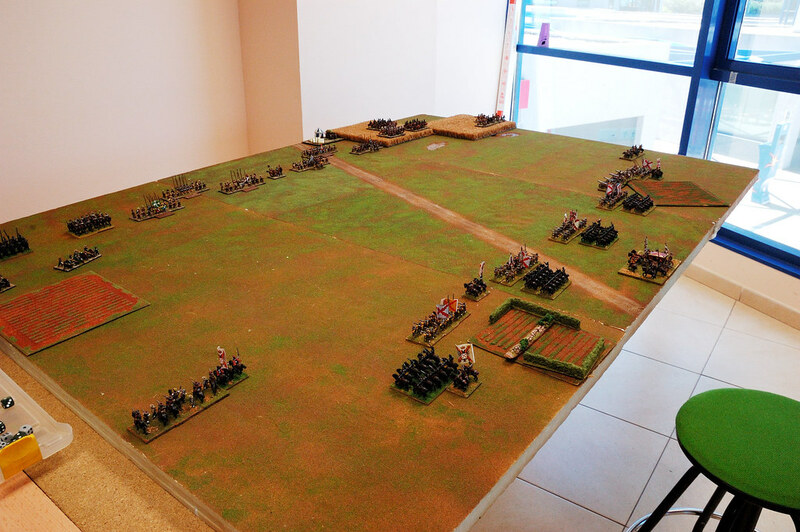 Unexpectedly, the french cuirassiers blocked by the plantation find a target and threaten the flank of the spanish cuirassiers locked in melee! 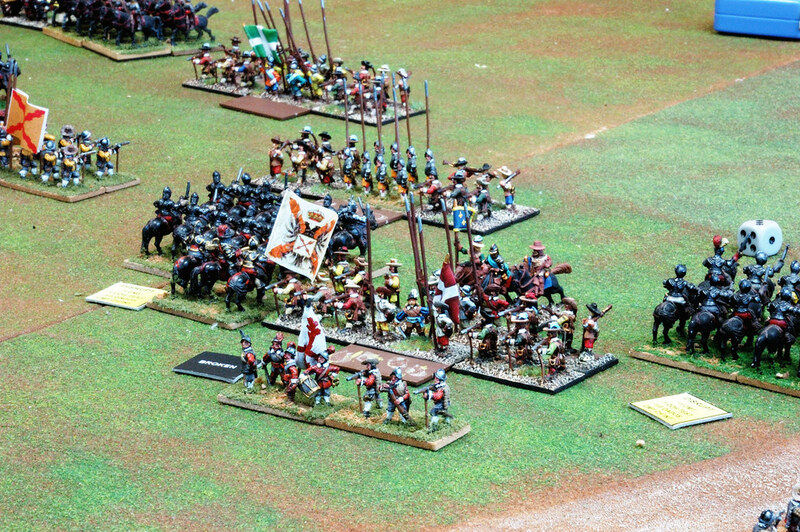 On the right wing the fight has definitively gone for the spanish army. 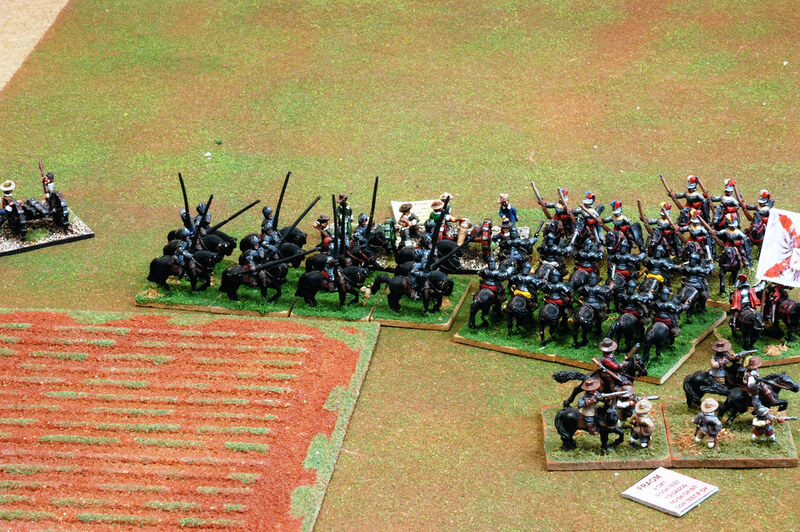 The french mounted that had charged the tercio break. 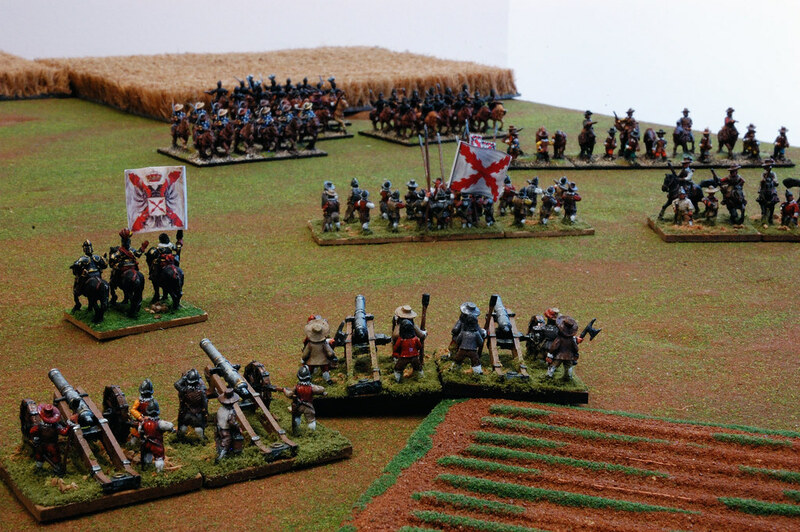 The Musketeers, after a defiant defense, finally get fragmented, and a french infantry regiment can´t stand the combined fire of musket and artillery. 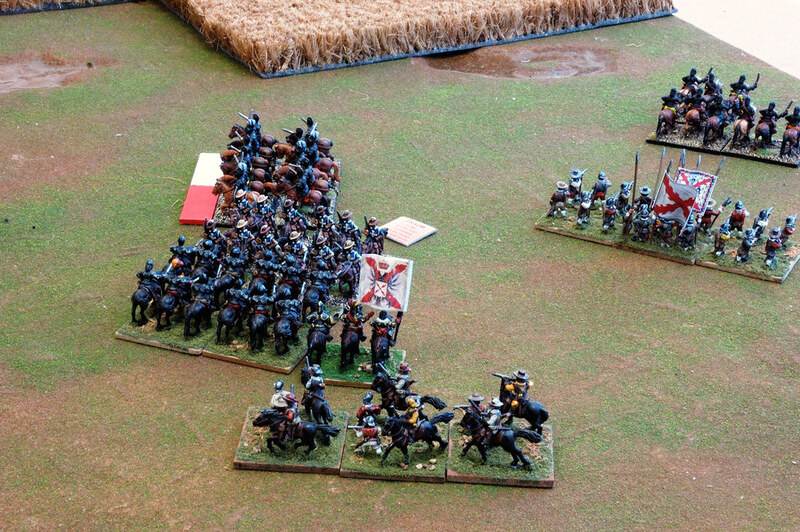 The sneaky cuirassiers charge the rear of the unfortunate french regiment at the same time that the tercio at their front. The french infantry fragments. More bad news for the french on the left wing. 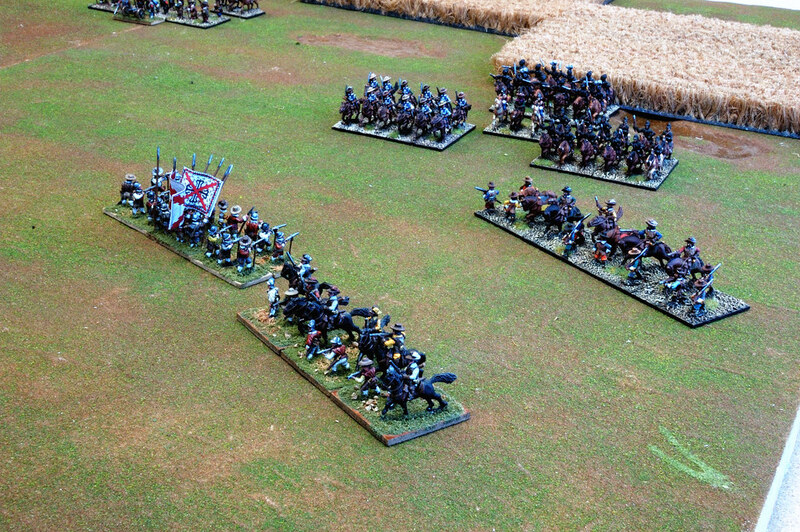 The spanish cuirassiers break their enemies and pursue away from the expected flank charge! 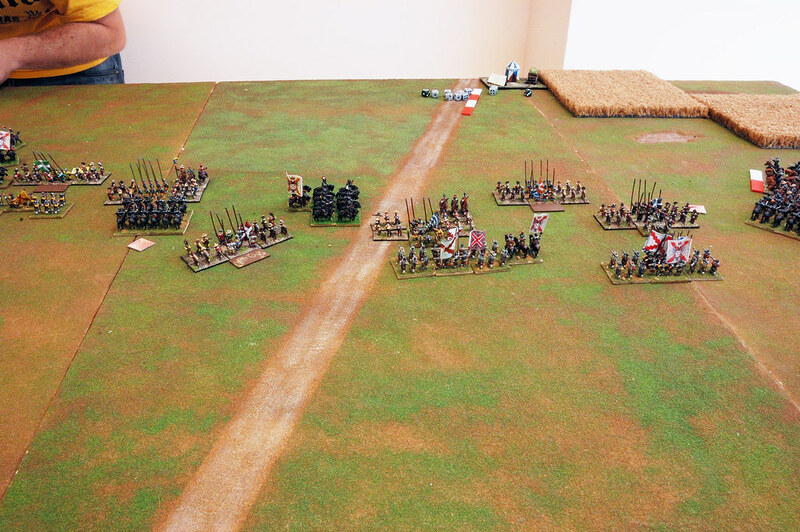 Then they turn and threaten the french artillery, that at this point is fragmented due to the dragoons fire, altough the dragoons are fragmented too. The french situation is unsustainable and the french High Command concedes defeat, and is honourably accepted by the Spanish CinC. 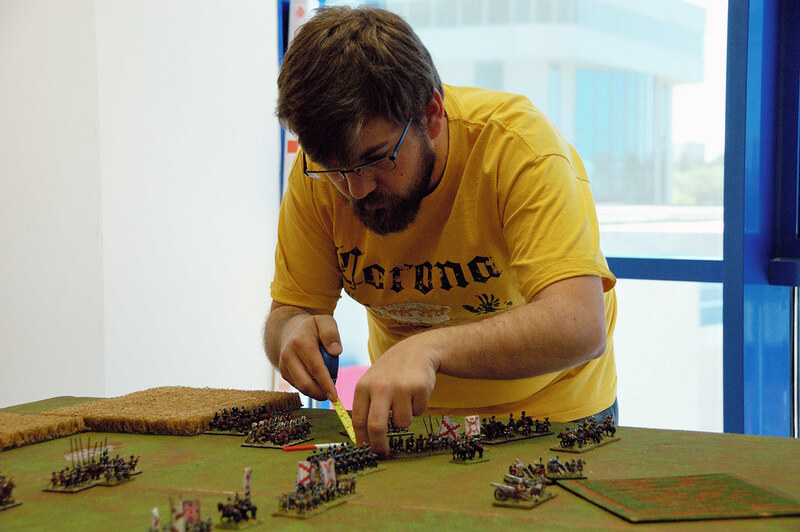 Victory for the Army of Flanders! Great report! It looks like the French artillery was deployed in the flank zones - was this a scenario as usually artillery has to be deployed in the centre. quackstheking wrote: Great report! It looks like the French artillery was deployed in the flank zones - was this a scenario as usually artillery has to be deployed in the centre. Looks like they are in a foot to me? 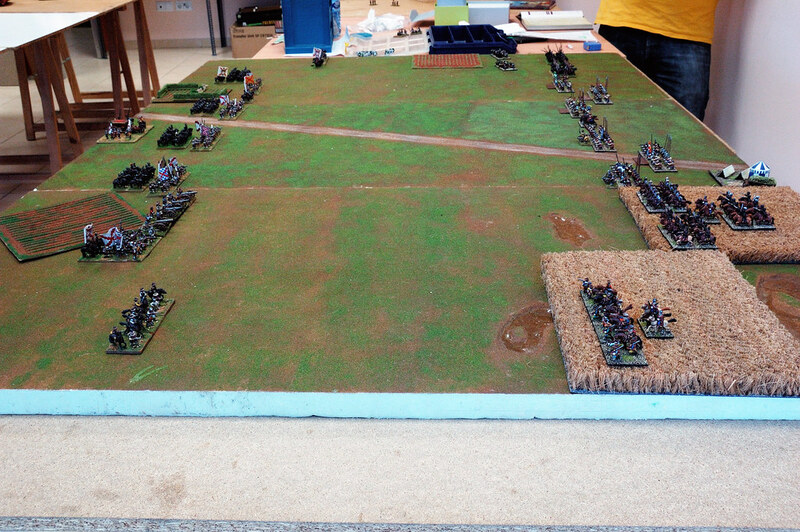 If you look at the 2nd picture, there is one BG of artillery on the edge of the board and then a gap which is 2 bases wide for the cavalry and then another BG of artillery. Also means they'll shoot at any foot as "threatened flank" and lose a POA. Ahh, yes, I see that now. Eeeermmm... yes, yes, it was an scenario. 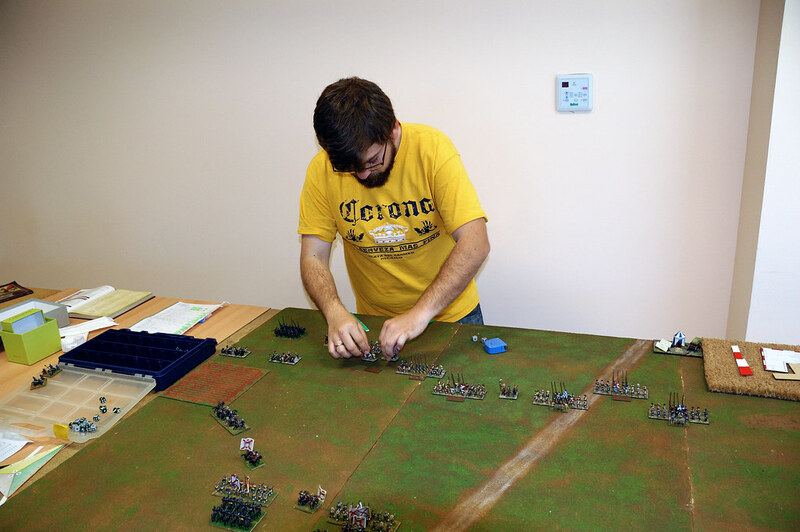 Proelium: Wargaming rules for 3000B.C. - 1901A.D.